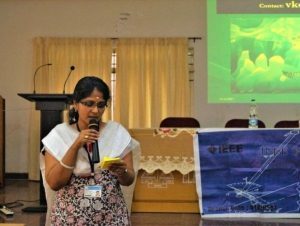 With the initiation of IEEE IA/IE/PELS chapter, a new student branch chapter of IEEE IES Society was formed at Vimal Jyothi Engineering College, Chemperi, Kannur in November 2017. 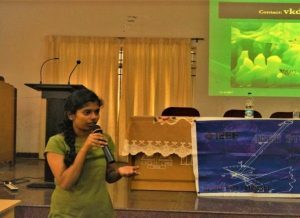 Around 10 B.Tech students, 20 M.Tech students and 10 Research Scholars of EEE Department got a golden opportunity to attend a lecture program organized by IEEE Industrial Applications Society on ‘GREEN ENERGY’ by V.K. Damodaran on November 4th 2017 from 10:00 am to 1:00 pm. 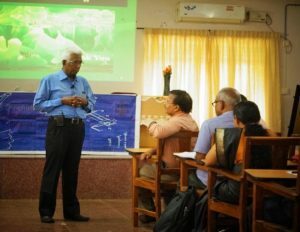 Prof. V. K. Damodaran apart from being a Fellow of IEI and Life Senior Member of IEEE (New York), he is also Chairman of FACES (Foundation for Advanced Clean Energy Studies) and holds other important positions in various institutions. Posters and notices about the program were broadcasted through social media and by word prior to the program. Google forms for free registrations were available online for the students and Ph.D. scholars. 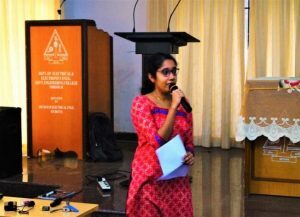 The event was coordinated successfully by Geethanjali K R (IEEE IAS Chairperson) of M.Tech Power Electronics, Sreenidhi T (Secretary IEEE SB) of S5 EC Department and Anjana P R (IEEE IAS Secretary). The program was conducted in the Maxwell Hall, EEE Department under the supervision of Prof. K.D. Joseph (IEEE Student Counselor) of EEE Department and Prof. Mini V (IEEE PES Staff advisor) under the absence of Prof. Jaison Mathew (IEEE IAS Staff Advisor). 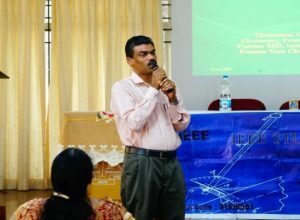 The talk was also attended by Dr. K K Ramachandran, Associate professor of Mechanical Department. 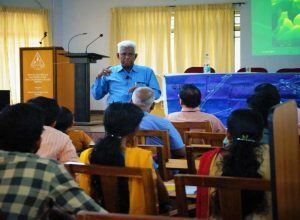 Damodaran Sir initially gave the audience consisting of 40 students and 4 teaching faculty members a detailed introduction about the existing renewable energy resources and their potential in Kerala. He narrated his valuable experiences during the implementation of various projects in Africa and China to all present. He also shared his perceptions and current goals on increasing the utilization of renewable resources in Kerala. He passionately displayed the solar energy harvesting unit installed at his residence. He mentioned the recent environmental issues of neighboring states and through his PowerPoint slides, he showed the world environmental statistics. He patiently engaged everyone present in the hall for a questionnaire at the end of the session. The session ended on a positive note and everyone was inspired by his works. The B.Tech IEEE students actively volunteered and attended to the needs of the audience. Feedback on the lecture program was given by Ms. Nirmal S (Research Scholar, EEE). Anjana P R expressed her sincere gratitude to Damodaran Sir in a few words. 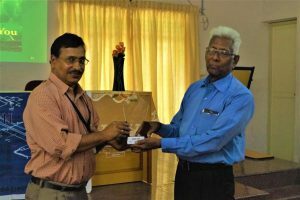 He was presented with a memento at the end by Dr. Nandakumar M (Head of the EEE Department). Kudos to the IAS working team and IEEE Kerala Section for providing this opportunity and timely support.